Searsport captains often married daughters or sisters of other captains from their home town, but not always. Florence Ferguson Pendleton (1856-unknown) married Captain James Nelson Pendleton on June 22, 1879. She was not from a seafaring Searsport family, but still followed her husband to sea for many years. She began to keep a journal immediately after their wedding. During this voyage Florence wrote long letters home and describes in detail having a tooth extracted in England at a cost of “$1.25 American.” Shopping engaged most of her time in ports they visited. She had an eye for the fashions of the day and often commented about the attire of the men, women and children they met along the way. Cultural pursuits often filled her days ashore, and she wrote of gardens, castle tours and the architecture of the surrounding villages and port cities visited. 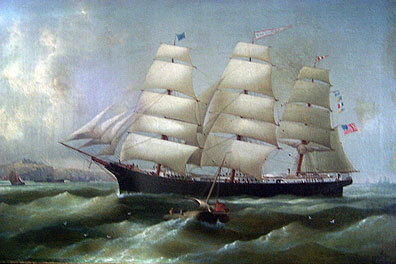 The largest sailing vessel built at Bucksville, South Carolina, was the ship Henrietta, launched in May 1875. She was named for the wife of Captain Jonathan C. Nichols of Searsport, who commanded the vessel. Captain and Florence Pendleton arrived back in Boston on April 13, 1881. With them was their infant son, Henry Ferguson, born at sea on April 9th.